Gigabit Fibre - when will Spark make an announcement on plans? Forums › Spark New Zealand › Gigabit Fibre - when will Spark make an announcement on plans? Hi Spark - have just returned to you for my UFB after a number of years with Snap/2Degrees only to see 2Degrees announce their gigabit plans and to say their 200/200 customers will move to gigabit at the same price they were on for 200/200. Can you please confirm you'll be doing the same for your 200/200 customers - would hate to cancel and move back to 2Degrees after only being back with Spark for a month. Oh man it's so close I can taste it... :-) I wish I could officially tell you when. Spark customers can now buy Ultra Fast Fibre MAX, a broadband service delivered over gigabit technology. This new broadband plan option is now the fastest residential broadband service available from Spark. 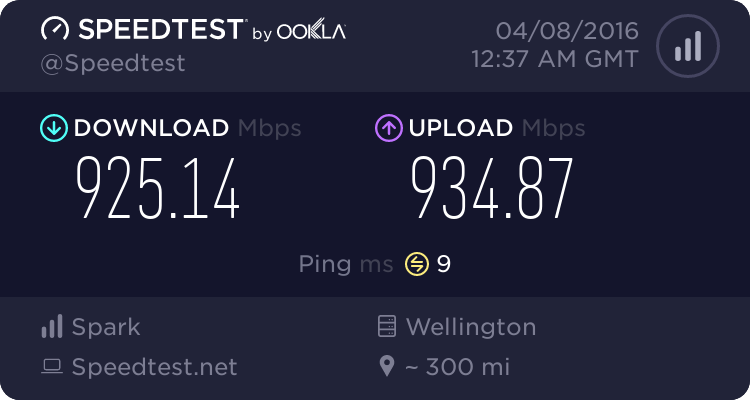 Spark’s Fibre MAX uses a gigabit connection over the UFB (Ultra Fast Broadband) network. The actual speed a customer will get varies based on a number of factors. For instance, to get the fastest speeds possible, customers will need to have high specification hardware in their homes and be testing over an Ethernet connection. When used in optimal conditions, Ultra Fast Fibre MAX should provide speeds of between 700Mbps and 900Mbps download / 400Mbps upload. In trials, even higher speeds have been achieved, of up to 930Mbps. Ultra Fast Fibre MAX can now be purchased nationwide for consumer and business addresses where the Ultra Fast Broadband (UFB) network is available – with a few exceptions. Services are not yet available in Queenstown, Greymouth, Oamaru or Whakatane until further notice, as work is being undertaken to ensure that the network is ready to support Ultra Fast Fibre MAX speeds. Otherwise, any customer with UFB available can purchase Ultra Fast Fibre Max: availability can be checked using Spark’s address checker. Customers can purchase a bundled broadband and home phone Fibre MAX plan with unlimited data for $149.99/ month – or a broadband only Fibre MAX plan with unlimited data for $139.99/ month. Businesses can purchase a bundled broadband and landline Fibre MAX plan with unlimited data for $212.85 ex GST – or a broadband only Fibre MAX plan with unlimited data for $179.85 ex GST. All consumer Spark Ultra Fibre plans come with: Lightbox on us – online TV; Spark Security Suite - 5 free McAfee Security licenses; email - free Xtra email service; 24/7 help and support - over the phone and online, including a live webchat service; and lots more benefits for Spark customers including Spark Thanks and 1GB a day Free Public WiFi. See www.spark.co.nz/getmore for details.